Nail polish can look great on your finger & toe nails, but not on your porcelain tiles! Once dried, it can be difficult to remove, as Sarah, one our of new clients found out recently (see her Facebook Review below). After advising Sarah on what to do (she had already tried nail polish remover & floor cleaner before hand), and with her having complete success with our instructions, we’ve decided to write this blog to help others who may have the same problem. Nail polish (or rather the dye contained within, i.e. the ink) requires a solvent or cleaner that can break it down so that it can be removed. Porcelain tiles have a hard surface that can tolerate most cleaning products. 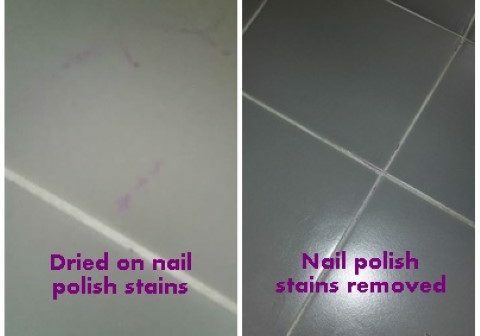 Follow the steps below to remove dried on nail polish, starting with the least abrasive/chemical cleaners and work up to more powerful applications until the stain is removed. Sarah was lucky enough only to need to follow the first step (hairspray), however some stains may require additional steps – see below. Step: 1. Begin by applying hairspray to the nail polish/ink area. You can spray it on, but it may be easier to get a good coating by removing the lid and pouring some on. Allow it to sit for a minute if possible, but DO NOT LET DRY. Hairspray contains alcohol, which is what lifts the ink. Wipe the area clean with a soft cloth. Apply more hairspray if necessary to keep the area moist. Repeat as necessary. Step 2. If the stain still remains, moisten a Magic Eraser and gently rub over the area. These erasers are slightly abrasive so avoid using too much pressure, but they often provide excellent results on these types of surfaces. Step 3. If the stain is still visible, use a clean cloth moistened with acetone nail polish remover (or plain acetone), and rub the area and remove the stain. Step 4. In the unlikely event that the stain is still on the surface, moisten a soft cloth with Isopropyl Alcohol and use it to gently scrub the area. Repeat as necessary until the stain is completely lifted. At this stage you should have been able to remove all of the nail polish ‘sealer’. If there is stain left, what you are now looking at is pure dye/ink. Step 5. Otherwise, lemon juice should be able to remove the dye, so slice a lemon into thick slices and put them on top of stain. Put plastic bag or cling wrap on top and then place an old heavy book/directory on top of that. Check hourly. If not, rinse off within 2-3 hours. Step 6. If for some reason all the above haven’t worked, you could try regular white toothpaste as another alternate cleaner that can be applied to dye stains. Simply apply and rub gently with a soft cloth. Rinse and allow the area to dry. Step 7. Whichever step or steps you have taken as above, use a mild hand soap solution afterwards to clean the surface and rinse completely to remove any residue from the cleaning products. 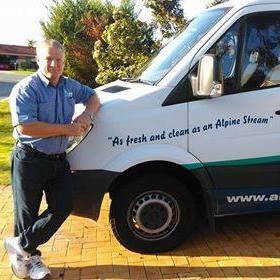 Should you require any stain removal advice, please contact us on 0411 225 720 or email us at info@103.27.34.4. Good Luck from the Cleaning Guru! Please note that this and any other tips given in our D.I.Y blog is to assist you in minimizing any discolouration or staining damage. Please follow instructions and measurements carefully as use of different quantities may have unintended consequences. These tips do not take in account individual circumstances, and we cannot be held responsible for any claim or action that may arise from using the information on this website. Please note that in some cases, there are different treatments for different fibres/fabrics – i.e. natural or synthetic. These tips are not a substitute for the treatment that we would offer as a professional carpet cleaner. If in doubt, please call us immediately.